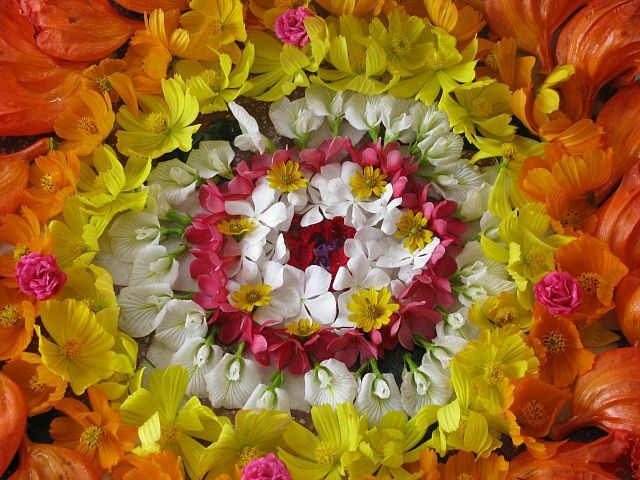 A typical flower arrangment (or pookalam). Credit: Madhutvin/Wikipedia. The harvest festival of Onam is a moveable feast: it colours the landscape of Kerala in South West India in a rhythm of elaborate dances, music, sports and banquets. A festival of secular tradition, where different faiths and castes celebrate. It falls on the Malayee month of Chingnam, which coincides with Shavan Masa of the Indian calender. This ten day celebration falls between August and September 15. It honours the homecoming of the beloved King Mahabali, who makes a yearly return to Kerala. Legend dictates that the jealous king of the gods, Indra, hatched a plan to oust Mahabali. Indra begged Lord Vishnu for protection who then transformed into a Brahmin boy, or dwarf, named Vamana. The people of Kerala adorded the wisdom and generosity of King Mahabali; Vamana sought to exploit the latter. He approached King Mahabali and asked for as much land as his feet could cover in three steps. Upon granting what appeared a simple and humble request; Vamana grew at an exponential rate; one footstep covered the sky and the stars. The second step covered the netherworld. Vamana then turned to King Mahabli, who came to realise that a third step would destroy the Earth. To prevent this calamity, Mahabli offered his head. Before disappearing, Vishnu granted the King’s request to return to the Earth once a year. Preparations for the festival begin with a cleaning and decorating of the house. Onam presents an opportunity for family members to wear new clothes. For women, the traditional outfit is the kesav saree (a white saree with golden border), for men, it is the mundu (a white dhoti with golden border). Outside of houses, rests the pookalam (athapookalam), or flower mat. This is a symbol of welcoming King Mahabali. Mahabali visits his kingdom on the second day of Onam, the most important day of the festival. Mounds of earth representing Mahabali and Vishnu rest in courtyards, decorated with flowers. The Thrikkakara Temple, in Thrikkakara, two kilometers east of Idapally near Cochi in Kerala, remains one of the few Indian temples dedicated to Lord Vamana (the fifth incarnation of Lord Vishnu). Thrikkakara means ‘the holy place where Lord placed his foot’. Other celebrations incorporate traditional Kathakali dances and parades with fireworks and elephants. The Vallamkali (boat race) sees around one hundred oarsman take to the water in spectacular boats. Others sing traditional songs, called Onappatt. In Thrissur, artists paint their bodies in the likeness of tigers to perform the annual ‘Pulikali‘ or tiger dance. This folk art performance settles on the theme of tiger hunting to entertain during Onam. Others in Thrissur began celebrations with a tug-of-war. Prime Minister Narendra Modi, retired cricketer Sachin Tendulkar, Congress Vice President Rahul Gandhi, and some Bollywood celebrities wished individuals a happy Onam.